The tranquil routine of Rangaraju’s retired life was in for a rude shock. On the morning of 10th November, people from the Tamil Nadu Farmers Association landed up at his doorstep. They wanted to uproot the harvest in his paddy farm. The farmers told him his rice field had a genetically modified crop whose harvest could contaminate food supplies if it was not destroyed. A bewildered Rangaraju didn’t know how to react. He asked them for time to consult Mahyco, the company that was conducting a field trial in his plot. But before he knew it, the 150-odd people in the crowd had uprooted the Bt rice crop from his field in Ramanathapuram village near Coimbatore in Tamil Nadu. In a matter of one day, this unassuming retired schoolteacher found himself in the midst of an international controversy over genetically engineered crops. Rangaraju is not alone. Last month, the Bharatiya Kissan Union (BKU) burned the harvest of Bt rice trials in two farms in Haryana and Uttar Pradesh. In Rampura village in Karnal district of Haryana, they burned the field to prevent contamination. When they reached Rudrapur village, Gorakhpur district in UP, BKU activists got the police to seize the grain that was lying in the plot. Along with Panchayat president of the village, they filed a police complaint against Mahyco, the Department of Biotechnology and the Genetic Engineering Approval Committee, for several violations found in a GM Rice trial plot. Here too, the farmers and the panchayat were not aware of that the seeds were genetically modified and had no clue of the likely dangers of growing them in their fields. They had merely leased out the land to Mahyco and signed the agreements without knowing what genetically modified actually means. 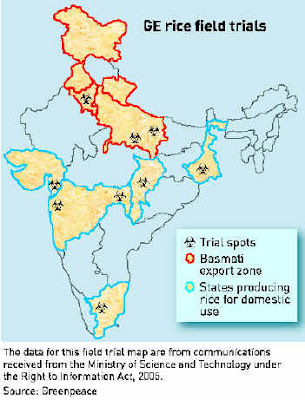 The company is conducting 10 field trials of Bt rice in six states across the country. Bt rice is a genetically engineered seed designed to make the crop resistant to pests like stem borer and leaf folder. The seeds are created by inserting a synthetic version of a gene (called Cry1Ac) from a naturally occurring soil bacterium called bacillus thuringiensis (bt) into the plant’s DNA so the plant creates its own toxin to destroy the pests. India has allowed the commercial sale of Bt cotton seeds, and the trials for Bt Brinjal are also underway. In September this year, the Supreme court temporarily stopped the Genetic Engineering Approval Committee (GEAC) from granting permission for any more field trials for GM crops. The court was responding to a petition which pointed out several irregularities in the regulatory procedures. Currently, Indian rules allow field trials to start even before biosafety tests are completed. Moreover, monitoring of these trials are extremely lax, almost non-existent. The petition also pointed out the inherent conflict of interest evident in the constitution of regulatory authorities. Senior office-bearers and members of the GEAC are also part of biotech industry-promoted bodies or are crop developers themselves in their personal or institutional capacities. Currently around 150 trials for GE food crops are underway ranging from brinjal to tomato, mustard, maize and of course, rice. No country in the world has cleared the commercial sale of Bt rice. The impacts on human health have not yet been fully tested. 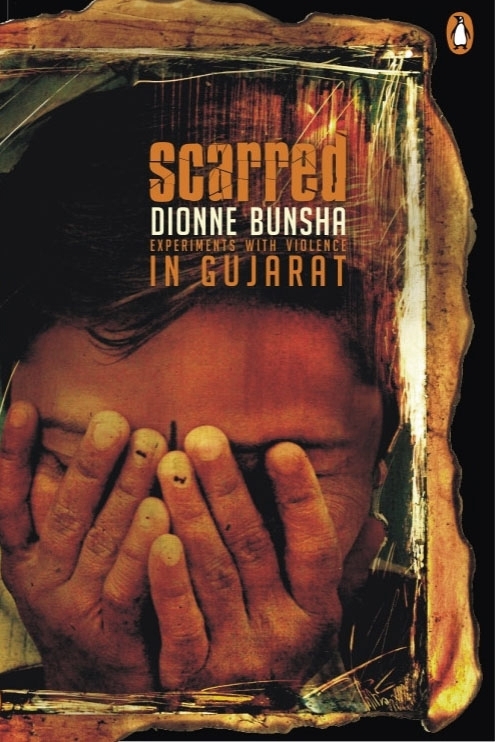 A recent study in Madhya Pradesh found that farm workers exposed to Bt cotton had allergies – skin eruptions, swollen faces. Moreover, the Bt toxin can enter the human digestive system and interfere with the bacteria in the intestines. The Cry1Ac gene is a powerful immunogen and can prompt adverse reactions from the immune system. Studies worldwide have shown that eating GM food could result in wasteful growth of gut tissues and bacterial proliferation, intestinal tumours, immune system suppression, interference with the development of the body’s vital organs and reproduction. Earlier this year, there were mass deaths of cattle grazing on the remains in harvested Bt cotton fields in Warangal district in Andhra Pradesh. GM plants could harm the environment and biodiversity. Once out in the fields, there is no way of knowing whether normal plant varieties have been contaminated by the GM variety through pollination, which could lead to the extinction of local crop varieties. Moreover, there is also a danger that insects could develop resistance to the toxin, after which more pesticides would be needed to get rid of them. Farmers groups aren’t alone in their protest against GM crops. Recently, rice exporters held a press conference with Greenpeace demanding that the government halt field trials. They are worried that if there is any contamination, it could harm exports. In August this year, US rice exports were adversely affected when it was found that certain consignments contained GM contaminated rice. The US Department of Agriculture (USDA) admitted that a variety of Bayer’s Liberty Link rice that was not approved for consumption or cultivation in the world (LL rice 601) had been detected in rice intended for export. This raised an alarm in the EU and Japan and adversely affected US rice trade. Indian exporters are scared that our exports could be similarly harmed if there is even a slight doubt of contamination. Greenpeace recently found that GE rice from field trials in China had found its way into imported Chinese rice products in France, Germany and the UK. Indian exporters are afraid our trade will suffer if any part of the harvest from field trials in India finds its way into food supplies. At present, India exports 400 million tones of rice worth Rs 700 crores. “Why are they so concerned about exports? We should think of filling our own bellies first. Bt rice will help increase productivity by reducing crop damage due to pest attacks,” M.K. Sharma, managing director of MAHYCO told Frontline. As much as 20% of yield could be lost due to the stem borer pest, which Bt rice guards against, he added. Sharma said that Bt cotton sales have been rising exponentially every year because farmers find them effectively. However, he dodged the fact that the places in Maharashtra and Andhra Pradesh where Bt cotton use is amongst the highest are also the areas where farmers suicides are the most. Environmental and agricultural research groups insist that they too were asking for scientific and transparent research. “While dealing with such technology, we have to follow the precautionary principle,” said Kavitha Kuruganti from the Centre for Sustainable Agriculture, Hyderabad. “Until independent scientific laboratory studies show that this crop is safe for human consumption, the government should not allow any field trials to take place.” At present, the biosafety testing is done by the company itself. Even though signatures were taken, field trials were conducted without warning the plot owners about the environmental hazards. “Contamination can take place even beyond the isolation distance. State and local authorities weren’t informed either. Regulatory agencies are not monitoring the field trials properly,” Ms Kuruganti said. During field trials of Bt cotton and Bt brinjal, it was found that untested products from the trials were being sole in the local market, she added. Often GE technology is pushed as the solution to India’s food security problem. However, environmental groups challenge this assumption, asserting that there are several other indigenous plant varieties that can boost farm productivity. “The real solutions for sustainable rice production already exist in farms around the world. They are based on traditional knowledge combined with cutting-edge technology, and are far more reliable and acceptable than destructive industrial agriculture and imprecise genetic engineering,” said Nammalwar, a well-known organic farming scientist from India. “The world’s most important staple crop is too important to gamble with. There are as many as 140,000 different varieties of rice, with an enormous diversity of traits, such as resistance to different pests and diseases and capacity to grow in salty or dry conditions,” said Divya Raghunandan from Greenpeace India. “We don’t need genetic engineering to take advantage of these traits – we need to preserve this resource and knowledge and combine it with safe hi tech breeding techniques.” Greenpeace has just released a report called ‘The Future of Rice’ by scientists Dr Emerlito Borromes and Dr Debal Deb which explains that GE technology is unnecessary since other more sustainable options exist to increase rice yields. Judging by the way field trials are being conducted, it seems like it’s not only the farmers like Rangaraju on whose plots the tests are underway, but also the Indian public, who are left in the dark, clueless of the dangers that GE technology could unleash.